Victoria Station, eastern side (the former London, Chatham and Dover Railway Station frontage). View from Victoria Street, London SW1. This Portland stone ashlar building has mermaid caryatids, broken pediments and slate roofs, and is the Edwardian baroque frontage designed by railway architects Alfred W. Blomfield and W. J. Ancell, with sculpture by Henry C. Fehr. According to the listing text, it was built 1909-10, though Network Rail states that it opened in 1909. Behind this frontage lies a considerably older structure, the south-east train shed designed by the engineer John Fowler in 1862; and the project as a whole goes back a few more years to 1858. This is when Fowler worked with John Kelk on bringing the line from another railway company, the Victoria Station and Pimlico Railway, over the Thames from Battersea, where it had originally terminated. The Grosvenor Bridge, more commonly known as the Victoria Railway Bridge, designed by Fowler and opened in 1860, was the very first railway bridge to cross the London stretch of the Thames (Weinreb et al. 975). Above the frontage for this other line's terminus, on the western side of the complex now facing the bus station, is the long brick and stone Grosvenor Hotel, with French pavilion roofs. Like the frontage shown here, this was also rebuilt in the early twentieth century. The two stations were amalgamated in 1923. 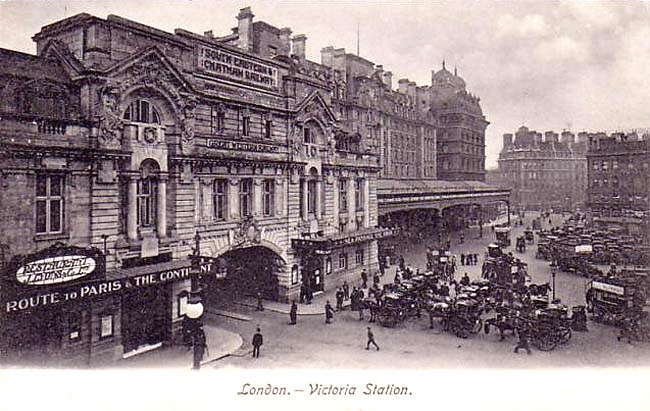 Victoria Station in the 1910s, showing both frontages. 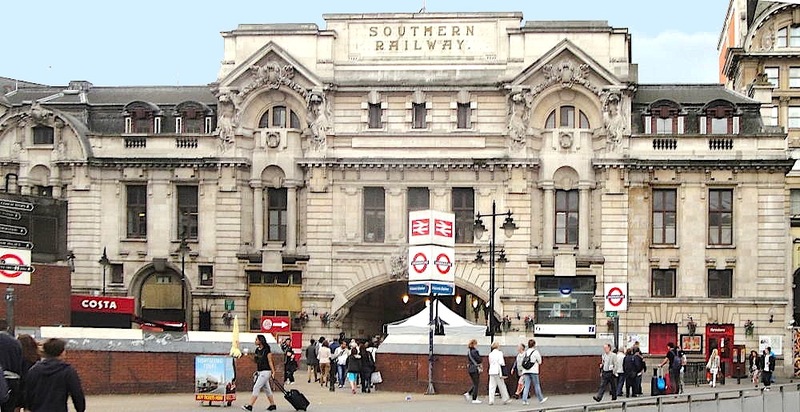 Note that at this date the sign inscribed at the top of the eastern frontage is "South Eastern & Chatham Railway"; also that the station awning carries the words, "Route to Paris & the Continent." It is hard to imagine now what a major enterprise all this was, or how important its effects were. As Jerry White has pointed out, as early as 1843 there was a choice of eight routes to Paris involving rail (78), but this provided a fast and direct route to the Continent, with boat trains operating from Chatham right from 1862. Both Fowler (1817-1898; one of the engineers of the Forth Bridge in Scotland) and Kelk (1816-1886) would later be honoured for their public works contributions. Kelk became a baronet in 1874, and Fowler, who became President of the Institution of Civil Engineers in 1865, was knighted in 1885. "History" [of the station]." Network Rail. Web. 7 November 2016. "Victoria Railway Station the Former London, Chatham and Dover Railway Station Including Train Shed, Westminster." British Listed Buildings). Web. 7 November 2016. Weinreb, Ben, Christopher Hibbert, Julia Keay and John Keay, eds. The London Encyclopaedia. 3rd ed. London: Macmillan, 2008. "William James Ancell." Dictionary of Scottish Architects. Web. 7 November 2016.